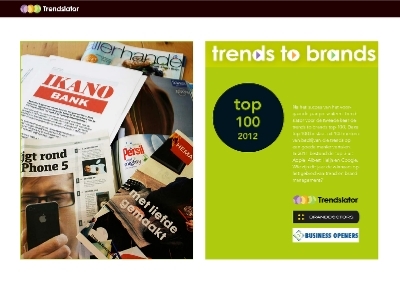 Trendslator published the Trends to Brands top 100 in the Netherlands. Brands should have a good balance between responding to a rapidly-changing world and a consistent brand identity. The T2B100 is a list of brands that understand how to translate trends into their brand. The aim of this research is to understand the value of trends and brand management for companies.